Sharks, Lasers, and MDF, Oh My! Everyone wants to play their games on a board loaded with beautiful terrain. In fact, we want our terrain to be as beautiful as the miniatures Corvus Belli puts out. Nothing gets new players interested in the game we all love faster than a beautiful demo board. 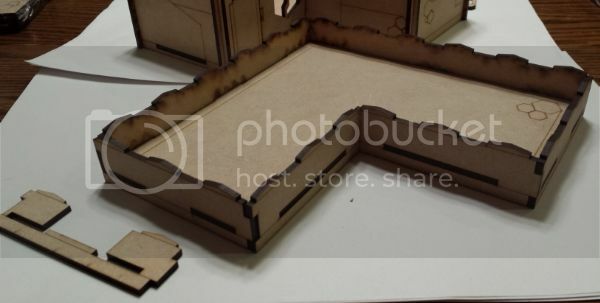 But much of the gorgeous laser cut terrain we see comes with a hefty price tag putting it outside nearly everyone’s budget. Luckily, Shark Mounted Lasers (SML) has you covered with several lines of laser cut MDF that’s both affordable AND stylish! Their main line of “Shark Slide” buildings are designed specifically with the budget conscious Infinity player in mind. The L-shaped building only costs $12, that’s insanely cheap for a building that looks as good as this. I really like all the burned in designs, there’s enough to make you notice them, without being a distraction. -The roof has gaps you can introduce to make room for ladders and walkways… smart. Just like when you build a mini, you want to dry fit all the pieces to make sure they fit correctly. 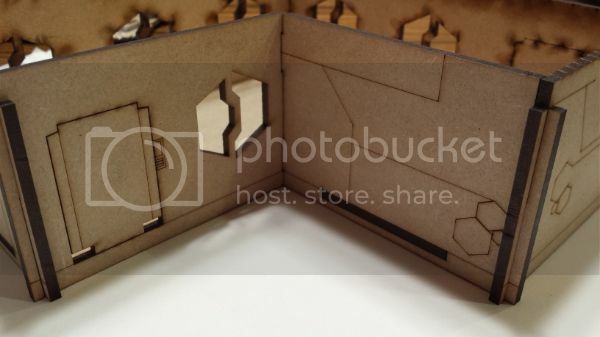 I’ve built a few pieces of laser cut MDF terrain that I’ve had to sand, shave, bend, and wiggle to the point I was afraid of breaking something! The optional space for ladders or bridges to slot into. Fitting the SML pieces together proved to be a dream. 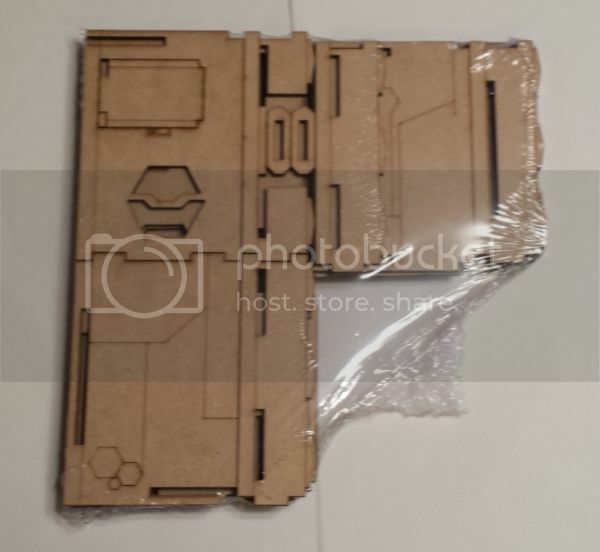 Everything came together smoothly, yet tightly… with no sanding required! If there is one thing I hate, it’s requiring glue to form a structural bond. SML buildings have nice interlocking features that are strong enough that you could skip glueing your buildings. They would still be stable enough to play with and would let you set up and break down buildings if storage space is at a premium. But I like my buildings a little more permanent so I’ll be gluing mine. I prefer to use a slightly thinned (With water) PVA glue (Elmer’s Glue All) that I apply with a brush. There’s no need to get crazy with this, use just enough to keep everything locked in place. Try to avoid all the burned-in designs since the glue will seep into them and obscure them when you try to paint them. Now that it’s assembled and the glue is dry we can see it’s a rather handsome design and perfectly suited for a game of Infinity. 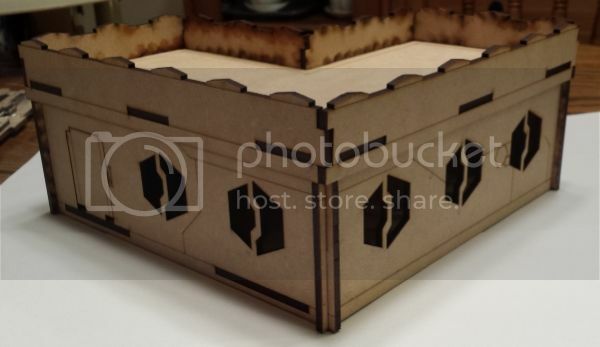 The building is sturdy and it’s design will blend well with other MDF buildings you might already have. Best of all, it didn’t break the budget! 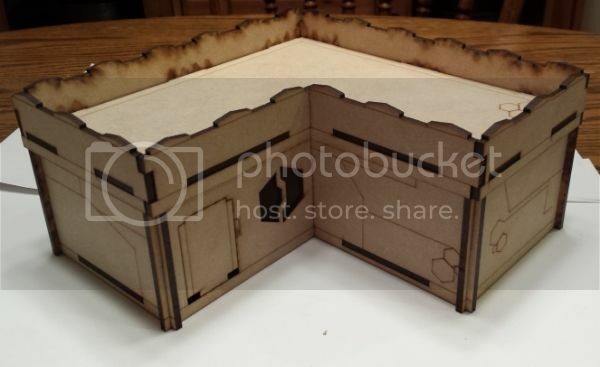 For a reasonable price you could put together a demo table full of these beautiful buildings or use them as accent pieces to your current terrain. Have you had any experience with Shark Mounted Laser’s terrain? Tell us your thoughts below or in the terrain forums here. You can also see what others have done there, and view all things SML in their forum section here.